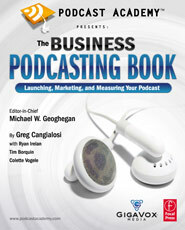 On Friday Sept. 28th at 1:00PM, all the authors of our new book, Podcast Academy™: The Business Podcasting Book will be doing an author signing at the New Media Expo. If you’d like to meet some of the original practitioners of podcasting, this is a great opportunity to see them all at once: Greg Cangialosi, Ryan Irelan, Tim Bourquin, and Colette Vogele. I’ll stop by as well. Check us out at the Expo’s book shop.